The next two days will be a "fairly critical" phase in the talks to free the 15 Royal Navy personnel captured by Iran, Tony Blair has said. The prime minister said he was "not looking for confrontation" and "the most important thing is to get the people back safe and sound". Earlier, a Tehran official said the issue could be resolved by negotiation. Iran accuses the crew of straying into its waters on 23 March. The British insist they were in Iraqi territory. Ali Larijani, of the Supreme National Security Council, hinted on Tuesday that a new phase in the talks with Britain had been started. Mr Larijani, who is also Iran's chief nuclear negotiator, told Iranian state radio: "The British government has started some diplomatic talks with the Iranian Foreign Ministry. They are only at the beginning. "If they continue this path they can change the situation logically... in such a way that the issue is resolved." Mr Blair said he had read the transcript of Mr Larijani's speech and it "seems to offer some prospect but the most important thing is to get these people back". He said from the start of the talks, Britain had two tracks - firstly to make Iran understand that "the pressure is there", and secondly that the "door is open" to diplomacy. Later, he added that if "peaceful, calm negotiation" to get the crew back was not possible the UK would have to take "increasingly tougher decisions". After his comments Iranian TV said Mr Blair had taken a "hardline" stance. Meanwhile, Foreign Secretary Margaret Beckett has said "we should be cautious in thinking that we're likely to see a swift solution in this issue... diplomatic efforts continue". She added that "some people have read a lot into the prime minister's remarks". "He is not intending to imply anything about military action," she said, pointing out that the UK shares Mr Larijani's "preference for bi-lateral discussions". New photographs of some of the crew, including Leading Seaman Faye Turney, were released on Tuesday, showing them wearing casual clothes for the first time. 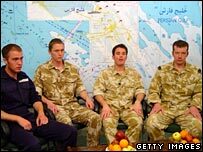 In one photo some of the Royal Navy personnel are shown sitting on the floor wearing tracksuits and smiling. LS Turney is not wearing a headscarf as she has in previous TV footage released by the Iranians. Another picture shows two members of the crew playing chess. Meanwhile, the names of some more of the service personnel being held have been confirmed. The BBC can confirm that Leading Seaman Christopher Coe, from the Dalton area of Huddersfield, is among the captives. And the family of Operator Maintainer Simon Massey, who is also being held, said they were going through a "very distressing time" at the moment. Meanwhile, the family of Royal Marine Joe Tindall have said they are "immensely proud" of him. US President George Bush described the Iranian seizure of the crew as "indefensible". "I support the Blair government's attempts to solve this issue peacefully," he said. There have been suggestions that the release of five Iranian officials held by the US since January could positively affect the navy personnel's case. The BBC's Jim Muir, in Baghdad, said senior Iraqi officials were working separately to secure the release of the British crew and the five Iranians held by the US. Earlier, Mr Larijani said he was committed to solving the crisis through diplomacy, and that putting the crew on trial was "not a priority". But he insisted in an interview with Channel 4 News he was "100%" sure that the navy crew had been in Iranian waters when they were picked up in the northern Gulf on 23 March. "A guarantee must be given that such violations will not be repeated," he said. The UK insists they were in Iraqi waters after returning from searching a merchant vessel. It is understood that one area that has been under discussion between the UK and Iran is how future disputes over the contested waters may be avoided. Previously unseen images of some of the crew, based on HMS Cornwall, were aired on Monday but their voices could not be heard. 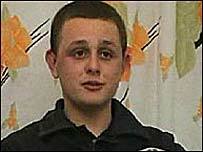 One of those seen for the first time was 20-year-old Arthur Batchelor, whose sister told the BBC she was relieved to see him looking "tired but fine". The Foreign Office is standing by its view that the crew, serving on HMS Cornwall, which is based in Plymouth, were detained against their will in Iraqi territory.